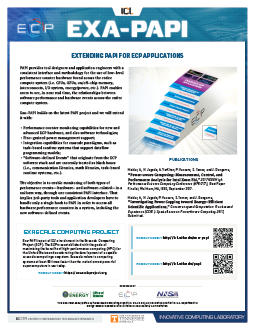 The Exascale Performance Application Programming Interface (Exa-PAPI) award builds on ICL’s Performance Application Programming Interface (PAPI) project and extends it with performance counter monitoring capabilities for new and advanced ECP hardware and software technologies. PAPI provides a consistent interface and methodology for collecting performance counter information from various hardware and software components, including most major CPUs, GPUs and accelerators, interconnects, I/O systems, and power interfaces, as well as virtual cloud environments. 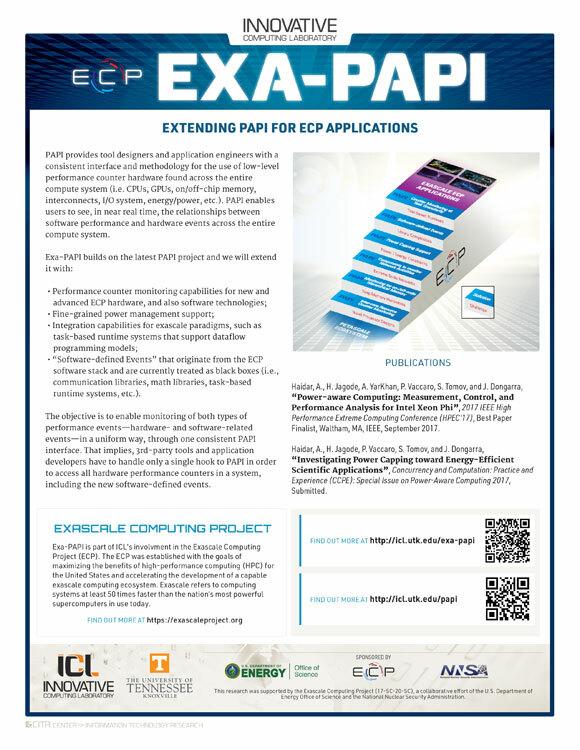 Exa-PAPI extends this effort with performance counter monitoring capabilities for new and advanced ECP hardware and software technologies, fine-grained power management support, and integration capabilities for exascale paradigms like task-based runtime systems. Exa-PAPI also adds events that originate from the ECP software stack, extending the notion of performance events to include not only hardware but also software-based information—all through one consistent interface.